In September 2011, 19 teams from colleges and universities in the United States, Canada, New Zealand, Belgium, and China competed in the fifth U.S. Department of Energy Solar Decathlon to design, build, and operate the most attractive and energy-efficient solar-powered house. On Oct. 1, the University of Maryland was declared the winner. Purdue University placed second, and Victoria University of Wellington (New Zealand) placed third. 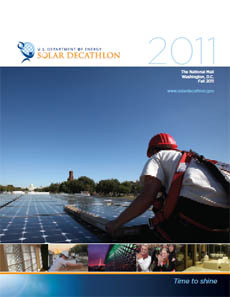 Read our brochure for an overview of Solar Decathlon 2011, or see the visitors guide for information about the 2011 event.